Over the past hundred years, the concept of the chakras, or subtle energy centers within the body, has seized the Western imagination more than virtually any other teaching from the Yoga tradition. Yet, as with most other concepts deriving from Sanskrit sources, the West (barring a handful of scholars) has almost totally failed to come to grips with what the chakra-concept meant in its original context and how one is supposed to practice with them. This post seeks to rectify that situation to some extent. If you're short on time, you can skip the contextual comments I'm about to make and go straight to the list of the six fundamental facts about the chakras that modern yogis don't know. First off, how do we define ‘chakra’? In the Tantrik traditions, from which the concept derives, chakras (Skt. cakra) are focal points for meditation within the human body, visualized as structures of energy resembling discs or flowers at those points where a number of nāḍīs (channels or meridians) converge. They are conceptual structures yet are phenomenologically based, since they tend to be located where human beings experience emotional and/or spiritual energy, and since the form in which they are visualized reflects visionary experiences had by meditators. Okay, I'll give it to you straight: for the most part, Western yoga understands almost nothing about the chakras that the original tradition thought was important about them. You see, if you read a book like Anodea Judith’s famous Wheels of Life or suchlike, it's important to realize that you are not reading a work of yoga philosophy but of Western occultism, based on three main sources: 1) earlier works of Western occultism that borrow and adapt Sanskrit terms without really understanding them (like Theosophist C.W. Leadbeater’s The Chakras, 1927); 2) John Woodroffe’s flawed 1918 translation of a text on the chakras written in Sanskrit in 1577 (see below for more on this); and 3) 20th-century books by Indian yoga gurus which are themselves mostly based on sources 1) and 2). Books on the chakras based on sound comprehension of the original Sanskrit sources so far exist only in the academic world. ‘But does that matter?’ yogis ask me. ‘I've benefited so much from Anodea Judith’s book and others like it, don't take that away from me!’ I won’t and I can’t. Whatever benefit you’ve received, from whatever source, is real if you say it is. I’m just here to tell you two things: first, that when modern Western authors on the chakras imply they are presenting ancient teachings, they’re deceiving you—but they don’t know that they are, because they can’t assess the validity of their own source materials (since they don’t read Sanskrit). Second, for those who are interested, I'm here to let you know a little bit about what yogic concepts mean in their original context (because I'm a Sanskrit scholar, and a practitioner who happens to prefer the traditional forms). Only you can assess whether that is of any benefit to you. I’m not claiming that older is intrinsically better. I’m not trying to imply there’s no spiritual value to Western occultism. I’m just approximating the historical truth in simple English words as best I can. So I’ll get on with it now: the six fundamental facts about the chakras that modern yogis don't know. 1. There's not just one chakra system in the original tradition, there are many. So many! The theory of the subtle body and its energy centers called cakras (or padmas (lotuses), ādhāras, lakṣyas (focal points), etc.) comes from the tradition of Tantrik Yoga, which flourished from 600-1300 CE, and is still alive today. In mature Tantrik Yoga (after the year 900 or so), every one of the many branches of the tradition articulated a different chakra system, and some branches articulated more than one. Five-chakra systems, six-chakra systems, seven, nine, ten, twelve, twenty-one and more chakras are taught, depending on what text and what lineage you’re looking at. The seven- (or, technically, 6 + 1) chakra system that Western yogis know about is just one of many, and it became dominant around the 15th century (see point #4 below). Now, I know what you're thinking—‘But which system is right? How many chakras are there really?’ And that brings us to our first major misunderstanding. The chakras aren't like organs in the physical body; they aren't fixed facts that we can study like doctors study neural ganglia (with which the chakras were confused in the nineteenth century). The energy body (sūkshma-sharīra) is an extraordinarily fluid reality, as we should expect of anything nonphysical and supersensuous. The energy body can present, experientially speaking, with any number of energy centers, depending on the person and the yogic practice they're performing. Having said that, there are a few centers which are found in all systems: specifically, in the lower belly or sexual center, in the heart, and in or near the crown of the head, since these are three places in the body where humans all over the world experience both emotional and spiritual phenomena. But apart from those three, there’s a huge variety in the chakra systems we find in the original literature. One is not more ‘right’ than another, except relative to a specific practice. For example, if you're doing a five-element practice, you use a five-chakra system (see point #6 below). If you're internalizing the energy of six different deities, you use a six-chakra system. Duh, right? But this crucial bit of information has not yet reached Western yoga. We've only just started down this rabbit hole, Alice. Wanna learn more? This might be the most important point. English sources tend to present the chakra system as an existential fact, using descriptive language (like “the mūlādhāra chakra is at the base of the spine and it is red” and so on). But in most of the original Sanskrit sources, we are not being taught about the way things are, we are being given a specific yogic practice: we are to visualize a subtle object made of colored light, shaped like a lotus or a spinning wheel, at a specific point in the body, and then activate mantric syllables in it, for a specific purpose. When you understand this, point #1 above makes more sense. The texts are prescriptive — they tell what you ought to do to achieve a specific goal by mystical means. When the literal Sanskrit reads, in its elliptical fashion, ‘four-petaled red lotus at the base of the body’ we are supposed to understand ‘The yogī ought to visualize a four-petaled lotus . . .’ See point #5 below for more on this. On countless websites and in countless books, we read that the mūlādhāra chakra is associated with survival & safety, that maṇipūra chakra is associated with willpower & self-esteem, and so on. The educated yogi should know that all associations of the chakras with psychological states is a modern Western innovation that started with Carl Jung. Perhaps such associations represent experiential realities for some people (though usually not without priming), but we certainly don’t find them in the Sanskrit sources. There’s only one exception I’m aware of, and that is the 10-chakra system for yogi-musicians that I’ve done a blog post on. But in that thirteenth-century system, we do not find each chakra associated with a specific emotion or psychological state; rather, each petal of each lotus-chakra is associated with a distinct emotion or psychological state, and there seems to be no pattern by which we could create a label for the chakra as a whole. This is not to say that putting a certain kind of crystal on your belly when you’re having self-esteem issues and imagining it purifying your maṇipūra chakra might not help you feel better. Maybe it will, depending on the person. While this practice is certainly not traditional, and has not been tested over generations (which is the whole point of tradition, really), god knows there’s more on heaven and earth than is dreamt of in my rationalist brain. Hey there—do you like this post? Do you want learn more? Then please sign up for my email list! You won't receive many mailings, and we'll never share your email. 4. The seven-chakra system popular today derives not from an ancient scripture, but from a treatise written in 1577. The chakra system Western yogis follow is that found in a Sanskrit text written by a guy named Pūrṇānanda Yati. He completed his text (the Ṣaṭ-chakra-nirūpaṇa or 'Explanation of the Six Chakras', which is actually chapter six of a larger work) in the year 1577, and it was translated into English exactly 100 years ago, in 1918. In an earlier version of this post, I called this seven-chakra system ‘late and somewhat atypical’. But after a few days, I realized that I was mistaken—a simpler version of the same seven-chakra system is found in a thirteenth-century postscriptural text called the Śāradā-tilaka, though that text does plainly acknowledge that there are multiple chakra systems (such as systems of 12 or 16 chakras). We also find a more elaborate version of the same system in the fourteenth- or fifteenth-century Śiva-samhitā. However, most yogis (both Indian and Western) know the seven-chakra system through Pūrṇānanda’s sixteenth-century work, or rather, through the somewhat incoherent and confusing translation of it, done by John Woodroffe in 1918. Still, it's true enough to say that this seven-chakra system has been dominant for the last four or five centuries. But it’s also true that the Westernized seven-chakra system you know is based on early-twentieth-century occultists’ interpretation of a flawed translation of a nonscriptural source. This by no means invalidates it, but rather serves to problematize its hegemony. Note that Tantric Buddhism (e.g., of Tibet) often preserves older forms, and indeed the five-chakra system is dominant in that tradition (as well as the more fundamental three-bindu system). For a typical five-chakra system as found in classical Tantra, see page 387 of my book, Tantra Illuminated. 5. The main purpose of a chakra system is to function as a template for nyāsa — installation of mantras and deities. As far as the original authors were concerned, the main purpose of any chakra system was to function as a template for nyāsa, which means the installation of mantras and deity-energies at specific points of the subtle body. So, though millions of people are fascinated with the chakras today, almost none of those people are using them for their intended purpose. That’s okay. Again, I’m not here to make anyone wrong, just to educate the folks who are interested. The most outstanding features of the chakra systems in the original sources are these three: 1) that the mystical sounds of the Sanskrit alphabet are distributed across the ‘petals’ of all the chakras in the system, 2) that each chakra is associated with a specific Great Element (Earth, Water, FIre, Wind, and Space) and 3) that each chakra is associated with a specific Hindu deity or deities. This is because the chakra system is, as I said, primarily a template for nyāsa. In nyāsa (lit., ‘placing’), you visualize a specific mantric syllable in a specific location in a specific chakra in your energy body while silently intoning its sound. Clearly, this practice is embedded in a culturally-specific context in which the sounds of the Sanskrit language are seen as uniquely powerful vibrations that can form an effective part of a mystical practice that brings about spiritual liberation or worldly benefits through magical means. 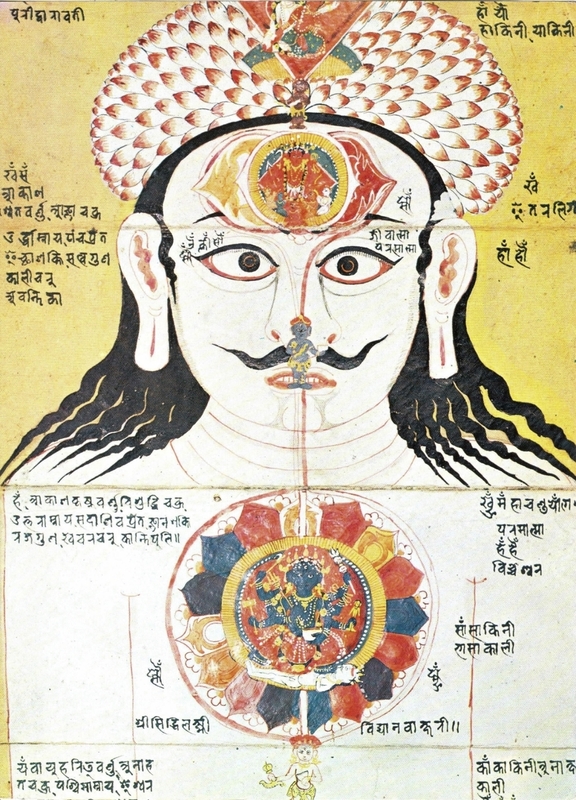 Invoking the image and energy of a specific deity into a specific chakra is also culturally-specific, though if Western yogis come to understand what those deities stand for, the practice could potentially be meaningful for them as well, though probably never as meaningful as for someone who grew up with those deities as paradigmatic icons emblazoned on their subconscious minds. The so-called Cause-deities (karana-devatās) figure largely in every chakra system. These deities form a fixed sequence: from the lowest chakra to the highest, they are Ganesh, Brahmā, Vishnu, Rudra, Īśvara, Sadāśiva, and Bhairava, with the first and last of these often not appearing, depending on the number of chakras. The last deity in the list of Cause-deities is never the ultimate deity of the given system, for that deity (whoever it is) is enthroned in the sahasrāra or thousand-petalled lotus on the crown of the head (which technically is not a chakra, since chakras by definition are pierced by Kuṇḍalinī in her ascent or descent, whereas the sahasrāra is her final destination and home). Therefore, Bhairava (the most esoteric form of Shiva) is only included in the list of Cause-deities when he is transcended by the Goddess, the latter being the ultimate deity in many of these systems. This is simpler than it sounds. You’ve been told that the seed-mantra (bīja) of the mūlādhāra chakra is LAM. Well, it’s not. Not in any Sanskrit source, not even in Pūrṇānanda’s somewhat garbled syncretic account. And the mantra of svādhiṣṭhāna chakra is not VAM. Wait, what? So the main point is that the fundamental mantras associated with the first five chakras on every website you can Google actually do not belong to those chakras per se, but rather to the five Elements installed in them. This is important to know if you ever want to install one of those elements in a different place. “Gasp! I can do that?” Totally. In fact, in different Tantrik lineages, we find the Elements installed in very different places. For example, the Saiddhāntika lineage installed Earth in the heart chakra. What do you think might be the effect on your relationships of always installing the Wind element in the heart center? (Remember, YAM is the mantra of Air/Wind, not of the anāhata chakra, whose intrinsic mantra is actually OM.) D’you ever notice that modern American yogis have really unstable relationships? Could that possibly be connected to repeatedly invoking Wind on the level of the heart? Nahhh….. (I can be funny now because only a small percentage of my readers have made it down this far.) So maybe you want to install some Earth in the heart sometime, cuz grounding is good for your heart. In that case, it’s kinda handy to know that LAM is the Earth element mantra, not the mūlādhāra-chakra mantra. Furthermore, most of the geometric figures associated with the chakras today also properly belong to the Elements. Earth is traditionally represented by a (yellow) square, Water by a (silvery) crescent moon, Fire by a downward-pointing (red) triangle, Wind by a hexagram or six-pointed star, and Space by a circle. So when you see those figures inscribed in illustrations of the chakras, you now know that they actually are representations of those respective Elements, not of a geometry inherent in the chakra itself. We’ve barely scratched the surface of this subject. No, I’m not kidding. It’s really complex, as you can gather by taking a look at the scholarly literature, like Dory Heilijgers-Seelen’s work, or Gudrun Bühnemann’s. It takes uncommon patience and focus to even read such work, let alone produce it. So here’s what I hope will be the result of this post: some humility. A few less claims to authority when it comes to really esoteric subjects. Maybe a few less yoga teachers trying to tell their students what the chakras are all about. Heck, I’m humbled by the complexity of the original sources, and that’s with fourteen years of Sanskrit under my belt. This is still mostly uncharted territory. So when it comes to the chakras, don’t claim you know. Tell your yoga students that every book on the chakras presents only one possible model. Virtually nothing written in English is really authoritative for practitioners of yoga. So why not hold more gently the beliefs you've acquired about yoga, even while you keep learning? Let’s admit we don't fully understand these ancient yoga practices yet; and instead of seeking to be an authority on some oversimplified version of them, you can invite yourself and your students to look more clearly, more honestly, more carefully, and more non-judgmentally at their own inner experience. Postscript: This post is getting a wider circulation than I'm used to, and some people who don't know me interpret my wry tone as arrogance or sarcasm. In fact, I’m a real softie at heart. Please read my bio so that you can assess my qualifications to make the statements that I do. Starting May 8, I'm offering a comprehensive course on this subject! Sign up here. Newer PostThe Eight Limbs of Yoga? . . . Think Again.